I’ve decided that my knitting must be guided by some sort of creative force that spurns being caged in the form of written notes. Thor’s (belated) birthday present is a cardigan with Brown Sheep’s discontinued “Prairie Silk” (72% wool, 18% mohair & 10% silk, 50g/88y/80m), purchased nearly 20 years ago and dyed some 10 years ago. While I frequently make up my own patterns and designs, I do so only for my own pleasure and creative outlet. I keep notes, of course, but no one else reads them except for me. 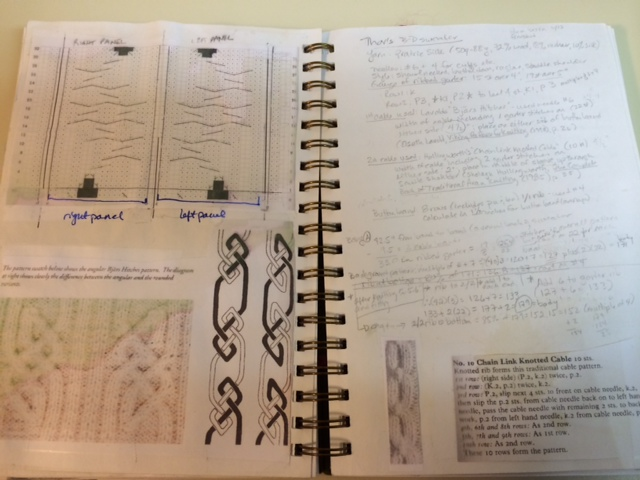 I decided this time I would keep notes so, if I chose, I could create a pattern and share the design. You’ve probably heard the phrase “… the road to hell is paved with good intentions?” Let’s just say I laid a lot of bricks on that road with this project. First, here are some pictures of my notes. While I might be able to translate my notes into some sort of sensible instructions, I’d rather just go onto my next project. 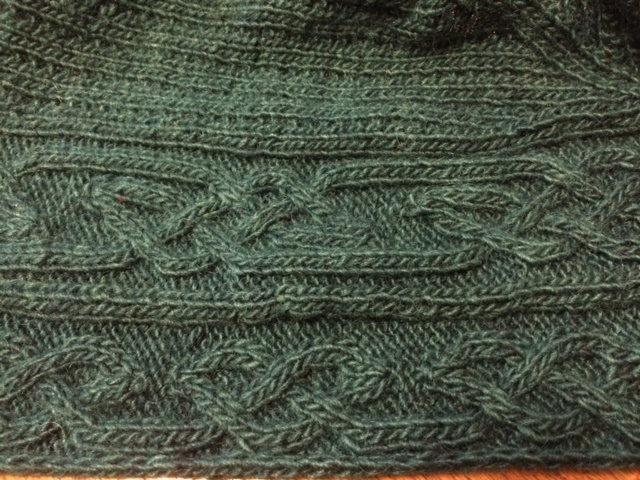 Second, somewhere along the line I realized my calculations for the sweater’s arms didn’t match what I had knit. 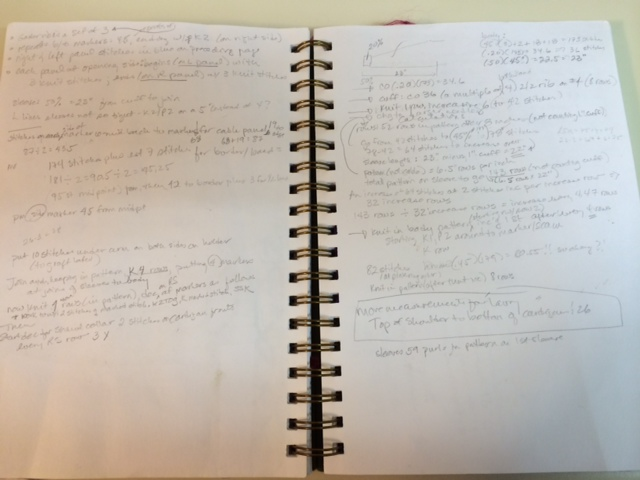 Hmmm … I checked my notes – no, nothing wrong with my math. After much proverbial head scratching, I realized I knit the arms on a different sized needle than the body. Nothing a little adjusting couldn’t fix, so I continued. Next, I decided I didn’t want to use a saddle shoulder with the raglan sleeves. Again, not a problem – just a few additional notes to make in my book. Fourth, before starting with the button band and shawl collar, I decided a narrower button band would look better than the one I planned. Easy enough to adjust my pattern once again! After some calculations, I knit Elsebeth Lavold’s “Running Knots” cable in two strips and then grafted them to the edge of the cable (Lavold’s “Bjärs Hitches) onto which I would have knit the button band in an earlier pattern. Lastly, I wondered what was I thinking when I knit a 2/2 ribbing at the bottom of the sweater! I didn’t like the way it looked against both the cables and the garter ribbed pattern of the body. Out came my sewing shears; I cut off the 2/2 ribbing, put the live stitches on a sturdy cotton yard, and then knit a new (folded) hem in the garter ribbed pattern that I will graft on tomorrow. Of course, now I have to cut off the current sleeve cuffs knit in 2/2 ribbing and knit new hems for the arms too! I wonder how many times I will change my mind with the button band and the shawl collar?! This entry was posted in Knitting and tagged Elsebeth Lavold. Bookmark the permalink. 23 Responses to Does “the Force” Guide Your Knitting?! I think I’ve been driving Thor crazy with all the revisions I keep making to his sweater. I think he just wants me to finish it up asap so he can wear it! Something about typing out my notes …just doesn’t foster or nourish my creative spirit! I guess neither of us feels a compunction to publish our designs! I feel your pain! I’d feel compelled to unravel and start again! Given the amount of cutting and reknitting I’m doing, I’m not sure I’m bow worthy! 🙂 I now need to cut and redo the cuffs and then knit the button band/shawl collar. I love a hand made journal, sketches, notes and calculations. You just don’t see enough of this real work on the internet. Bravo for sharing. May the force be with you. Oh man, the amount of mind changing and ripping and reknitting and recalculating I do every time I design is absurd. It’s one of the reasons most of my designs are self-published. I might have no trouble producing exactly what I said I would on time, but if I get halfway there and decide some other way would look better, I will absolutely hate every second from then on. I can not wait to see this finished product! I often start knitting, sure I will be able to tell by my copious notes precisely how I am creating this garment, only to find out as I cast on the second sock/sleeve/mitten that I either can’t read my writing, or that my definition of “copious” has changed dramatically. I bow to you, my friend. Maybe I could cut and knit in pockets?! Soon … I’m running out of things to cut or reknit on his sweater! 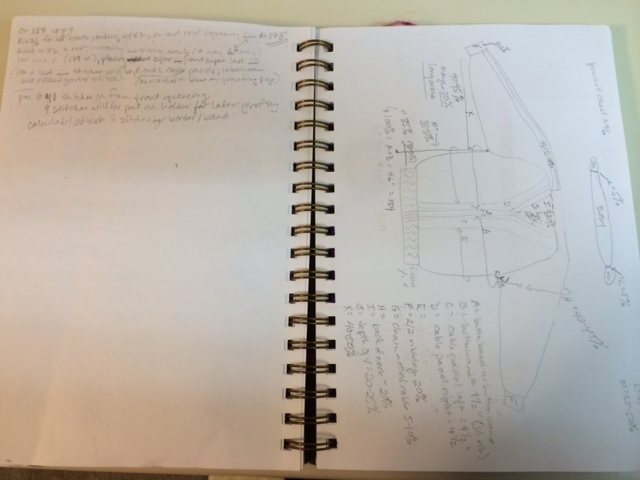 I am really bad when I create a pattern in that I don’t write enough down to keep me on track if the garment takes me a while. I need to start putting my notes into a book like you do – maybe that would get me straight. I am like you in that if Anything bothers me about what I have done, it needs correcting however I do a lot of ‘junk’ projects because I have been intrigued by a stitch I haven’t seen before or a fun shape or I find a yarn that I want to try out. Frankly, I knit because I like the process, not so much to end up with a garment. The grandchildren get most of my focus on creating something useful and I love making hats and scarves for one of my daughters-in-law. She is so sweet and appreciative. Thanks for the inspiration to pull myself together! LOL! I wonder if Thor is wondering if he will ever get his sweater!? This is exactly why I’ll never make it into Ravelry!!! Lol! Great post! I gasped when you mentioned CUTTING off the ribbing. Pretty brave. At least you are nearing the end of the sweater. I like the book you keep it all in. I scatter written notes much like Hansel Und Gretel did bread crumbs. Papers in upstairs rooms and downstairs rooms, time spent searching for the correct sheet with the info I need. Unfortunately, some times it takes a little longer because I forget what it is I was searching for. When the written pattern is complete, in proper form, I know the Force has been carrying me. Who else could keep track of my loose filing system?